With major successes in medical and recreational legalization in recent years, the marijuana business is beginning to experience a surge in demand for cannabis products, increasing industry competition locally and throughout the country. Looking toward the future, it’s only a matter of time before national, comprehensive marijuana legalization takes hold, bringing focus toward how the cannabusiness will continue to grow and thrive under a new, legal regime. As more marijuana businesses become established, the demand for marijuana marketing jobs has become increasingly evident. While in the past, the sheer appeal of medical marijuana was enough to get consumers excited and unfold their wallets, attitudes are changing as more options for cannabis products are made available. As complex.com shrewdly points out, even the way the collective American consumer base refers to marijuana has changed as a result of marketing. Visiting a local marijuana dispensary, you’ll likely hear the word “cannabis” more than once or twice. This change in rhetoric is a result of a massive rebranding of the legal marijuana industry, starting with its name. The term “marijuana” (originally “marijhuana”) originates from American nativism as a anti-immigrant term for “devil’s weed,” which reinforced nineteenth and twentieth century America’s racist sentiments toward Mexicans. Given how pervasive this term is in a social and professional context, the process of rebranding the substance with its plant genus name, cannabis is an effort to dislodge prohibition era stigma toward the plant. In fact, Cannabis’ categorization as a Schedule I drug is largely based on inconsequential research and racist fearmongering. While even this article will continue to intermittently use the word marijuana, it is used as a vernacular, not an aggressive slang term. Now that it’s clear how important marijuana marketing jobs are in redefining the marijuana industry, it helps to understand how these techniques can profit individual businesses. In the age of the internet, business marketing is carried out via a variety of platforms including social media, web content and other forms of online and print advertisement. Medical and recreational marijuana dispensaries are taking advantage of marketing by including basic social media advertising as a daily task of working as a budtender or receptionist. This may include updating store menus, advertising specials and posting pictures on sites like Facebook, Instagram and Twitter. For more professional advertising, dispensary owners may contract marketers to perform advanced branding and advertising tasks such as website design and search engine optimization development. Given the high saturation rate of dispensaries located in major cities on the west coast and Colorado, shops must find avenues to stand out in order to be a competitor in the industry. Dispensary marketing jobs focus on the unique brand of individual dispensaries–what each shop has to offer that others may not. First and foremost, a dispensary must be confident in the products it offers–What is being sold? Where is it coming from? Especially for growing legions of cannabis connoisseurs, dispensaries with high quality items may draw in greater numbers of visitors. Though federal law doesn’t technically allow for the official labeling of cannabis products as organic, there is major appeal surrounding natural and organically produced crops. Additionally, dispensaries that offer a wider variety of cannabis products and consumption methods benefit from a diverse stock that draws in both smokers and nonsmokers. Especially for medical marijuana patients who desire higher doses of THC and CBD, the more options, the better. Aside from the product, cost is perhaps the most influential factor in customer retention. While marketing cannot independently change how expensive a product is, marketers may highlight how great a product is for its price. On the other hand, for dispensaries that offer legitimately low prices, this is an integral selling point to highlight. Portland dispensary, Nectar offers industry low prices and even free and discounted products during certain promotions. For this reason, the shop draws in massive crowds of people who want an acceptable quality of weed, but don’t have the finances to shell out major coin. Another facet of a dispensary’s appeal lies in its staff. A good receptionist and budtender can make a major impact in a shop’s success, so it pays to promote this through advertising via social media. This presence helps to establish dispensaries as friendly, comfortable neighborhood spots that keep people coming back year after year. The general vibe of a dispensary plays the utmost importance in separating one store from the pack. Dispensaries that adhere to certain stylistic and cultural trends may experience success when integrating an already “fashionable” product with a strong aesthetic. Some dispensaries capitalize on the youthful energy of cannabis culture, while others focus on cannabis as medicine. Recently, “upscale” dispensaries have been cropping up, featuring minimal design and professionalism not unlike that of a third wave coffee shop. Search Engine Optimization, referred to as SEO, is an internet phenomenon. The essential focus is to optimize viewership of a business’s online profiles and content. SEO is an important advertising tool as there is inherent credibility given to businesses that appear on the first page of major search engines like Google. The sheer exposure of a dispensary’s website, for instance, acts as a powerful form of advertisement, as people rarely search past the second page of Google. SEO is a skilled marijuana marketing job, and one that is in high demand today. Considering search engines are a predominant forum for researching businesses, marketers maximize SEO by creating high quality content, utilizing keywords and including internal and external links to optimize a website’s ability to be recognized and filed by search engines. Sites like Google have specific protocol for aggregating websites which has spurred time tested methods for widening online audiences. Marijuana marketing jobs of this sort require quality writers, who can consistently create rich content, while seamlessly integrating SEO tactics. 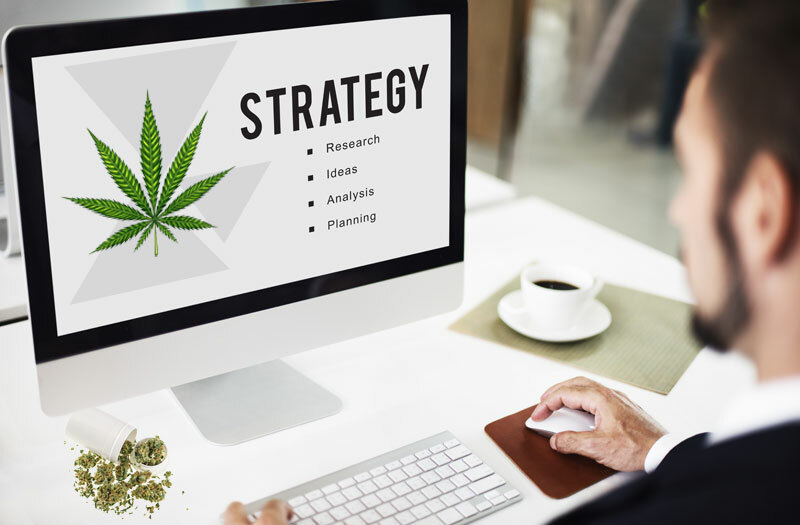 Companies like 420 SEO Pros and Cultivate Content are taking advantage of cannabis industry demand for advertisement by offering services specifically tailored to promoting marijuana businesses like dispensaries and head shops. The company has several packages that include comprehensive web design and SEO. Additionally, they offer specific quotes for businesses, based on what they hope to achieve in marketing. Securing a marijuana marketing job usually requires a background in advertising, content writing and social media. After meeting with business owners, marketers should be able to pinpoint which areas of the brand require focus. They should then be able to take that information and apply it successfully when releasing advertising literature or SEO content. Pay for marijuana marketing jobs vary, especially since marketers are often working as independent contractors. With that said, experienced advertising companies and individuals can bring in impressive wages if they have a history of success in boosting a business’s viewership and revenue. Marketing and advertising are experiencing major development thanks to the marijuana industry. Not only are dispensaries taking advantage of marijuana marketing jobs, doctor’s offices, head shops, grow operations and more are doing their best to elevate their business out of a growing pool. In recent years, industry leading websites Leafly and Weedmaps have become the main source for dispensary marketing and are now omnipresent across the country. These sites are somewhat of a necessary evil as opting out of advertising on these forums would essentially exclude the business from reaching a larger demographic of followers. Advertising on these sites can be expensive, but the returns may easily outweigh initial cost. As the sites continue to grow, only time will tell if independent marijuana marketing jobs continue to exist and thrive.